It’s interesting how one small request can take your thinking into a completely new direction. Just this holiday season, that happened to me. Both of my wonderful girls came home. One from California and one from Minnesota. We were excited to be together again for the holidays. It had been a busy year and now we could just hang out and enjoy our time together. Our girls were raised in a mixed-religion household that focused on traditional holidays from Christianity and Judaism. I grew up Catholic and my husband is Jewish. By the time the girls got home just before Christmas, Hanukkah was long gone — it started early this year on December 6th. We sent Hanukkah cards and candy to mark the holiday for the girls from afar. Now, it was time for Christmas. Older daughter was there too, nodding her head and smiling. She knew what the request was going to be. Well, wasn’t that interesting? The girls wanted to continue a tradition that we long ago started, even though the holiday was over. That one simple request made a mark on me this year. Maybe because the girls are out of the nest now, so our time together is that much more precious? Or, maybe because I’m getting older and more sentimental? In any case, it was particularly meaningful that my daughters felt strongly that we have our traditional Hanukkah dinner. A lightbulb turned on for me. When we think about retirement and planning for both the beginning of retirement and the end of retirement, many of us tend to focus on assets and a financial legacy for our kids. But, what this one situation brought home to me is how important it is to continue the traditions that you built with your kids since they were little. Those traditions are the legacy they will take to heart when you are too old to carry them on or are long gone. It’s those family traditions that will be passed on through the generations. In my case, it’s a legacy of latkes! Obviously, I understand the value of traditions. But it was such a heartfelt request and one that I didn’t expect, that the layers of meaning became much deeper for me. So, I started really thinking about what my kids would like to have from their dear ole’ mom when I’m gone. What should my real legacy be to these most remarkable young women? One easy piece of the puzzle is that I want to leave them with all our traditional recipes. They are just learning to cook on their own, and by the time they will need these recipes, I’m sure they will be quite capable in the kitchen. I’d like to think it will be fun for them to pull out the recipes from their mom, in her handwriting, and bring a little of their long-ago holiday dinners to their own kitchen. I think what this surprise brought to my thinking is that I should embark on building a real legacy for my girls in lots of small ways. Starting with handwritten recipe cards seems like a good place to start. And, I’ll lead off with those latkes. Of course, having grown up in a Catholic household, I don’t really know how to make latkes consistently! Every year I try something a little different, and every year my husband says, “This is exactly how I remember my aunts making latkes!” He’s a wonderful husband. Grate the potatoes and onion(s) using a food processer grater. Scoop out into a colander and let drain for a few minutes. Return to the food processor with the sharp, mixing blade attached. Process for several seconds to create a nice “mush” with some potato chunks left in. Drain again to get as much water out as possible. 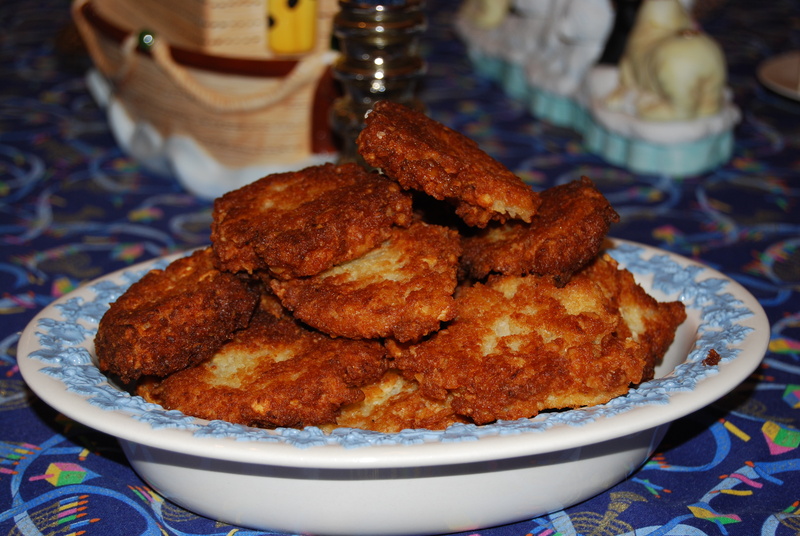 Combine potato/onion mush with matzo meal and eggs, salt and pepper until you get the right consistency – so that the latkes hold together in small rounds for frying. Not too wet, not too dry. Scoop by tablespoonful into a frying pan with just ½ inch of oil on medium heat. You want them to fry, but they aren’t deep fried or popping oil all over your kitchen. 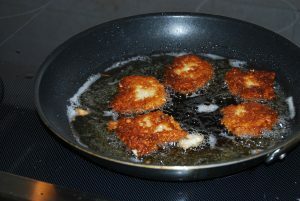 Frying up the delicious latkes. We like them crispy. Turn when golden brown on the bottom; fry the other side; and, remove to cooling racks lined with paper towels. We make about 50 latkes – they go like hotcakes! Serve warm with sour cream and unsweetened applesauce. And, be sure to take some time to talk about all the other Hanukkah parties you had and the fun that your kids remember about this tradition that became extra important to them to this year. At the end of my retirement, the girls might get some money or they might not. That will not be my legacy. Instead, I’ll help them carry on those traditions we set up so long ago and that became important to them. It’s a good feeling to know someday they will make latkes for their own families and friends. « To Retire Successfully, Become Financially Fearless!